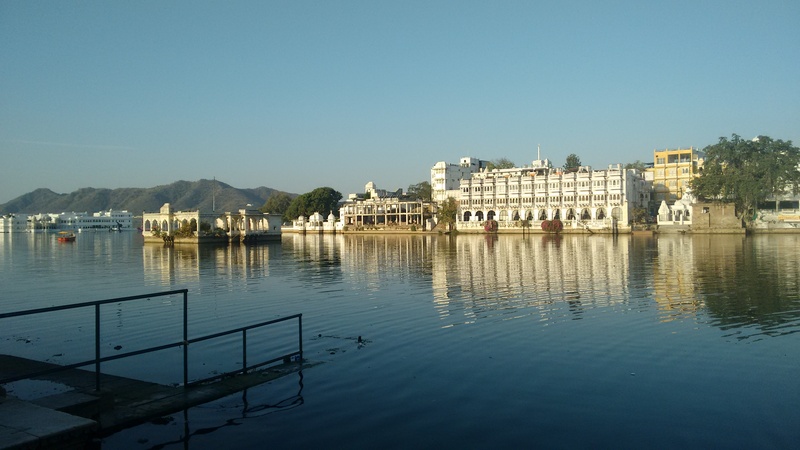 Popularly known as ‘Lake City’, ‘City of Lakes’ and ‘Venice of the East’ Udaipur is a famous tourist destination and a shooting location for many Bollywood films. From the stories of Maharana Udai Singh II,it’s founder, to the great war stories of Maharana Pratap, it drowns you in it’s rich culture and history. Located in southern slope of Aravalli Range, Udaipur is famous for it’s lakes, Rajput era palaces,gardens, arts and scenic beauty. 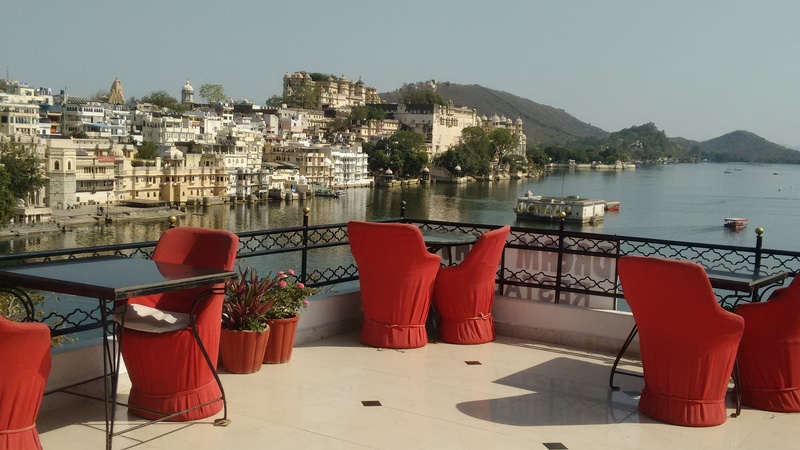 A two day trip is sufficient to cover Udaipur. 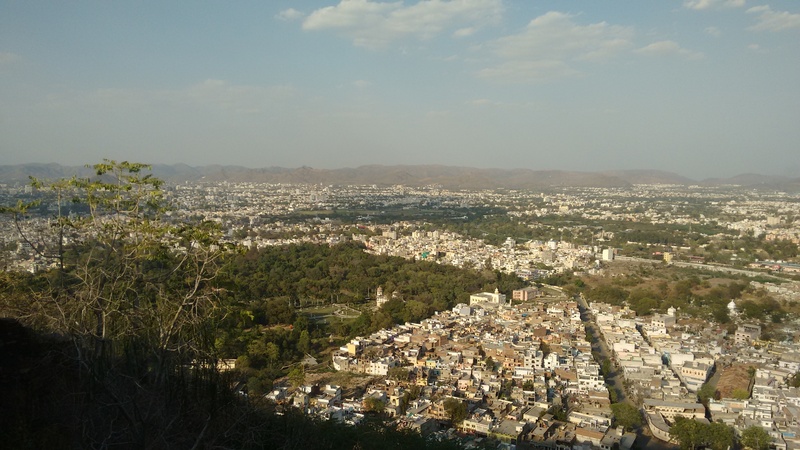 We reached Udaipur at around 2 P.M. Our guest house, Dream Heaven, was in Hanuman Ghat and it was a hassle to travel in the old city because of the narrow lanes. The hotel had a nice rooftop view, so we decided to have lunch there and then go sight-seeing. Mansapurna Karni Mata Ropeway: The cable car facility starts near the sunset point in Deen Dayal Park and ends near the Karni Mata temple on Machala hills. There is also a pedestrian path as an alternative to the ropeway. 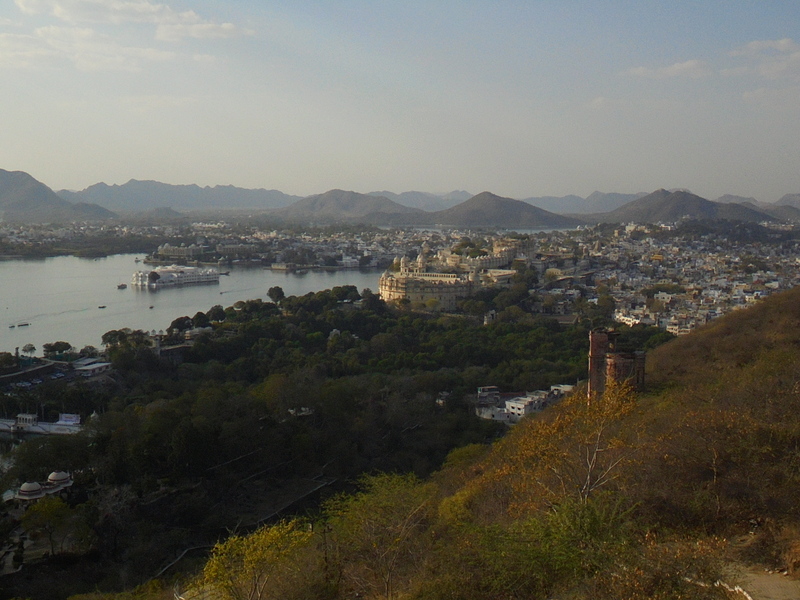 The ropeway provides a brilliant aerial view of the city; mainly the Lake Palace, Pichola Lake and City Palace. Once on top, you can get a fantastic view of the city and is completely worth the visit. The ropeway is open on all days from 9 A.M to 8 P.M. Starting at the entrance of the park, you can also enjoy a boat ride (open on all days from 9 A.M to 7 P.M) around the Lake Pichola. 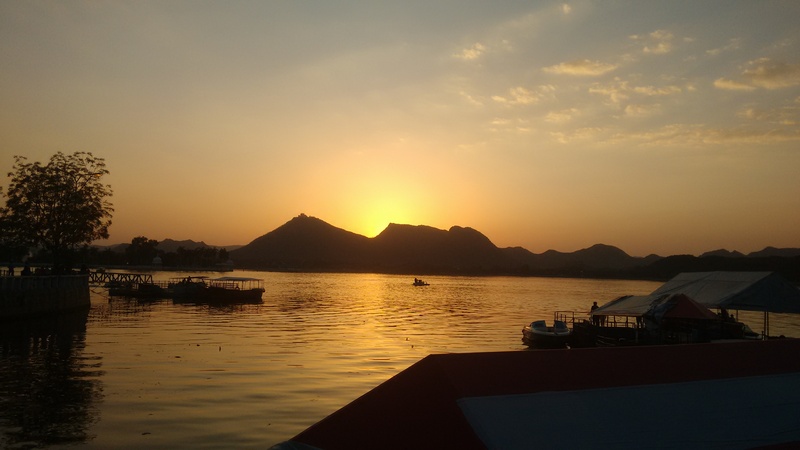 Fateh Sagar Lake: We reached the Fateh Sagar Lake just around sunset. Make sure you visit this place in the evening, and take the 30 minutes boat ride around the lake. If you think a normal boat ride isn’t fun enough, put on the jackets and take a steam boat. Boat rides are open on all days from 8 A.M to 9 P.M. The Fateh Sagar Lake is encircled by small hills and has three islands on it. 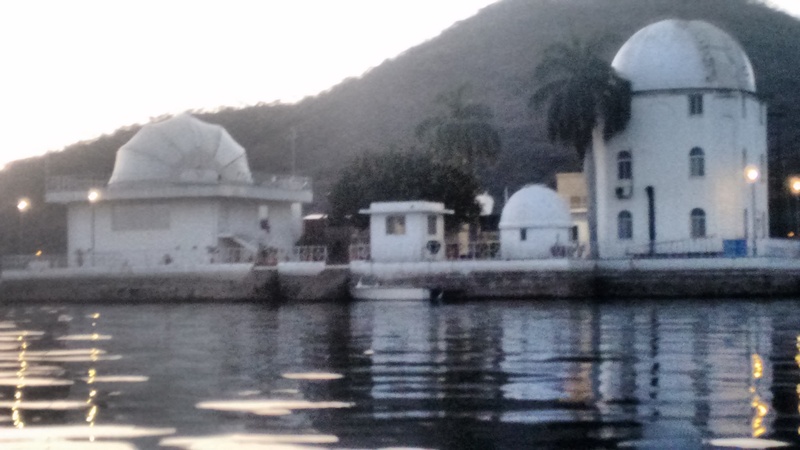 On one island is the Nehru Park, the second has a public park with some water fountains and the third stands home to the Udaipur Solar Observatory. We marveled at the glimmering lake surrounded by various palaces. There are a number of food stalls near the boating point and some of them sell excellent coffee. Try out a Kulhad coffee (coffee served in earthen pots) or cold coffee with ice cream at Vinod stall! Hathipole: As suggested by a friend, we went to the Hathipole market place. 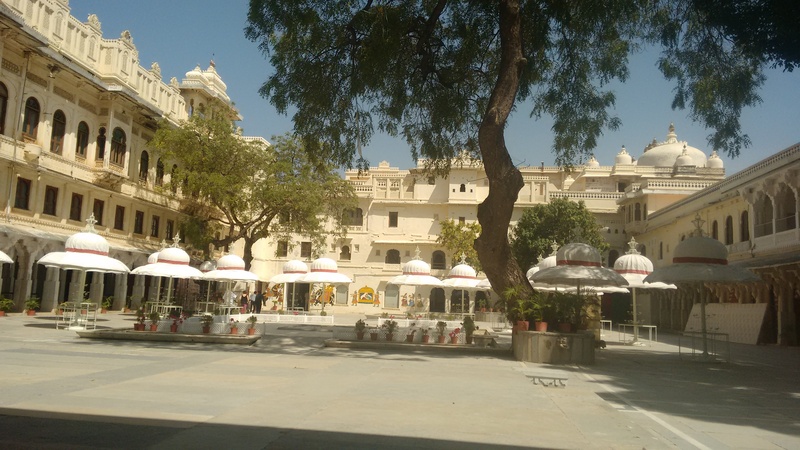 The place was huge and had a variety of shops, especially Rajasthani handicrafts (mainly those made of marble), traditional footwear stores and bandhani outlets. The plus point is that the handicrafts are really cheap. If you are planning to take away some souvenirs from Udaipur, this is the place! We reached back to the hotel at around 9 P.M and went to the rooftop restaurant to get a good view of the Pichola lake at night. The lake was adorned with lights from the havelis and palaces. This was a perfect place to relax after an entire day of sight-seeing. Sunrise at Gangaur Ghat: We decided to explore the place around us through a morning walk. We went along the Daiji bridge and watched sunrise at the Gangaur Ghat, a pleasant start to the day. 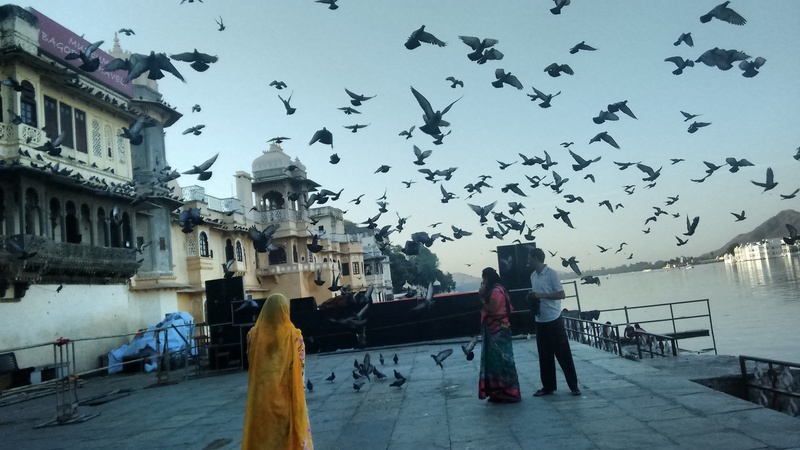 There were a lot of pigeons on the Ghat and many locals come there on their morning walks to watch the sunrise and feed the pigeons. Sit by the ghat and bask in the morning sun while the pigeons put up their show of circling the place every few minutes. 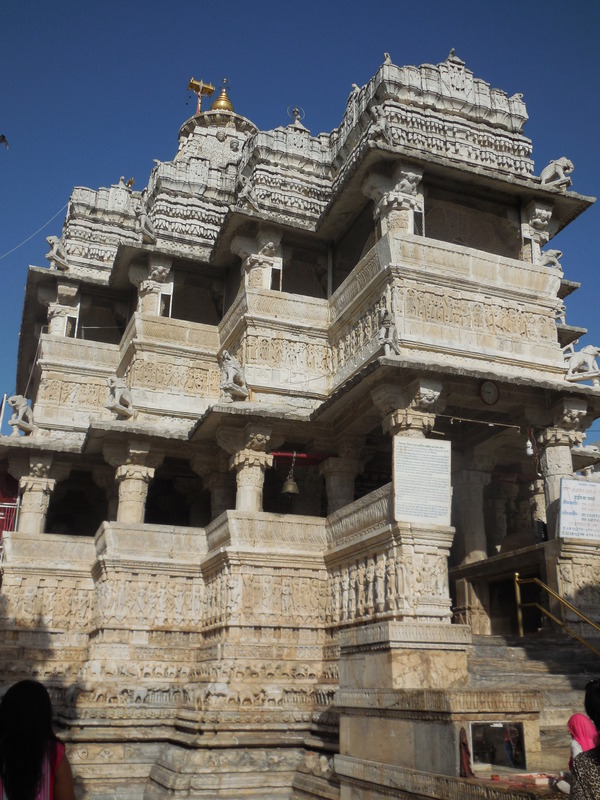 Jagadish Temple: Built by Maharana Jagat Singh in 1651 A.D, the Jagadish temple is the largest temple in Udaipur. It reflects Indo-Aryan architecture style and is built on a raised terrace.The temple is dedicated to Lord Lakshmi Narayana. 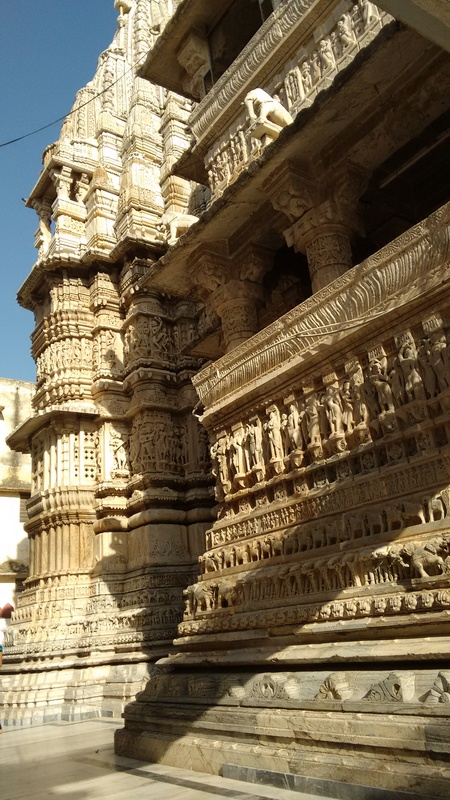 I was fascinated by the intricate carvings of elephants, horses and musicians on the temple walls. The inner dome reflected the enormous height of the double storied temple and even the shrine was very huge. The temple is truly an architectural beauty. Outside the temple there are many tiny stores selling Rajasthani dresses, paintings and crafts. City Palace: The City Palace is right next to the Jagadish Temple. Bulit over a span of 400 years, the City Palace complex stands proud on the east bank of the Lake Pichola. Once inside you will be taken through a series of corridors and stairs, open gardens, terraces and the 11 palaces. 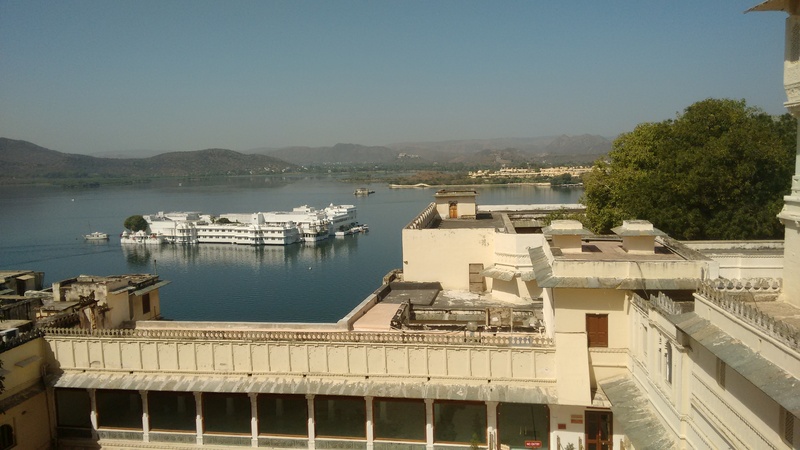 You can get various panoramic views of the Lake Palace and Jag Mandir as you move through the Palaces. 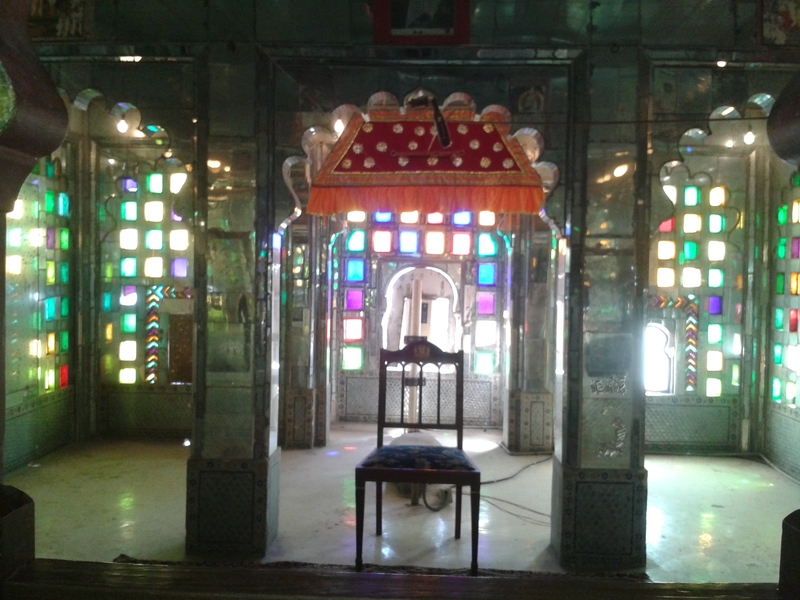 Some of the key places are Krishna Vilas, Zenana Mahal, Moti Mahal and Seesh Mahal. I found the mirror work interiors captivating. There were numerous murals and art works throughout the palace. The paintings drawn before the Mughal influence mainly depicted images of gods and goddesses while the newer paintings depicted themes like the Mughal kings, wars, and court meetings. I was also amazed by the collection of various silver artifacts used by the royal families. The magnificence of the palace can’t be explained in words. Your trip to Udaipur is incomplete without this visit. It shouldn’t take more than 2.5 hrs to take a complete tour of the City Palace. 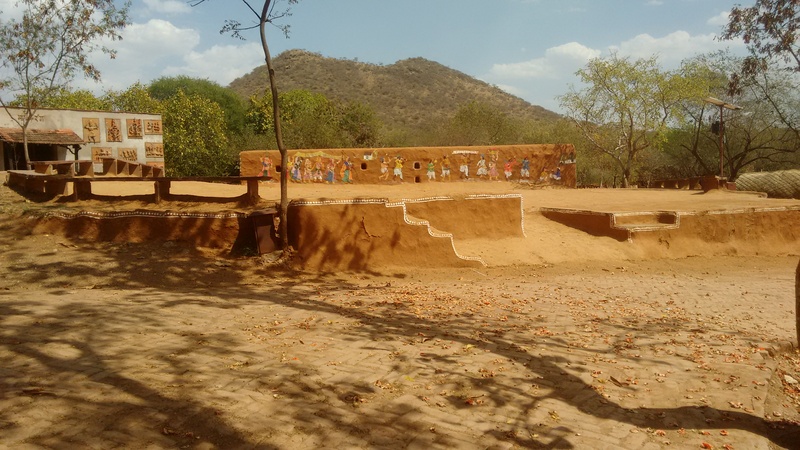 Shilpgram: Shilpgram is an artificial Rajasthani village that depicts a picture of the rural (dusty!) Rajasthan. 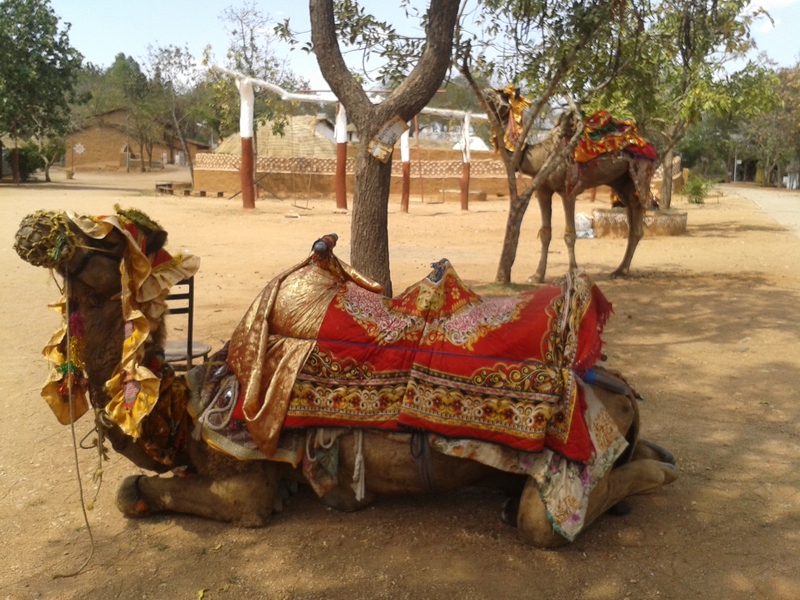 As soon as you enter, you will be greeted by traditional dancers and musicians dressed in Rajasthani costumes and decorated camels. The village has many craft shops, some nice pottery and a tribal museum. An annual crafts fair is held in the month of the November/December. We did not visit Sajjangarh fort, Saheliyon-Ki-Bari and Bangalore-Ki-Haveli. You may also add vinatge car gallery and crystal gallery to your list if either interests you. You can skip Shilpgram in case of a tight schedule or if you not visiting during the crafts fair(around December). P.S: The route we took was Pilani-Chittorgarh-Udaipur-Kumbhalgarh-Pilani. I will write about Chittorgarh and Kumbhalgarh forts in my next post. Previous PostPrevious When was the last time you told your parents you love them?